We present here an analysis of the pay and employment effects of the scheduled minimum wage increases to $15 by 2023 in California as a whole and in Fresno County, one of the poorest areas in the state. Our estimates of the effects of a $15 minimum wage are also based upon existing research on labor markets, business operations, and consumer markets. Our estimates compare employment numbers with the adopted policy to employment numbers if the policy had not been adopted. Other factors that may affect employment by 2023 are therefore outside the scope of our analysis. Our analysis does not incorporate recent laws that raise minimum wage in numerous California cities to $15 on a faster pace than the statewide policy. We do so to simplify the presentation and to focus on the overall statewide impact by 2023. We pay special attention to Fresno County because it is one of the poorest areas in the state. Many better-off and more expensive California cities have already examined the effects of higher minimum wages and enacted their own $15 laws. We consider here the effects of a $15 minimum wage in a less affluent and lower costs of living area of the state. California has more than recovered from the Great Recession. Indeed, California’s economic growth ranks as one of the highest rates among all fifty states. As a result, California’s unemployment rate has fallen from its 2010 recession peak of 12.5 percent in 2010 to 5.3 percent in November 2016, close to the 2007 pre-recession annual rate (5.4 percent in November 2007). Despite improving economic conditions, median real earnings in California were about the same in 2015 as their 2007 pre-recession level. Increasing the minimum wage to $15 would increase earnings for 5.26 million workers, or 38.0 percent of California’s workforce. Among those getting raises, annual pay would increase 25.4 percent, or about $3,900 (in 2015 dollars) on average. 96 percent of workers who would get increases are over 20; 58.2 percent are over 30. Latinos comprise 55 percent of workers getting increases. Workers who would get pay increases are less-educated than the overall workforce, but almost half (47.3 percent) have at least some college experience. Workers getting increases are disproportionately employed in part-time jobs and are less likely to have health insurance through their employer. Workers who would get pay increases earn close to half of their family’s income. There are downstream benefits from the proposed wage increase, such as improved health outcomes for both workers and their children, and increases in children’s school achievement and cognitive and behavioral outcomes. Three industries account for almost 40 percent of the private sector workers who would be getting increases in California: retail trade (16.5 percent), restaurants (14.6 percent), and health services (8.2 percent). 79.2 percent of workers in the restaurant industry would receive a wage increase. Total wage costs would increase by 15.7 percent for restaurants and 2.8 percent across all employers. Employee turnover reduction, automation, and increases in worker productivity would offset some of these payroll cost increases. Businesses could absorb the remaining payroll cost increases by increasing prices by 0.6 percent through 2023. This price increase is well below the annual inflation rate of 1.8 percent over the past five years. Price increases in restaurants would be 5.1 percent. Using past trends on population and employment, we project that state employment without the minimum wage increases will grow 1.40 percent annually between 2016 and 2023. Our estimate projects a very small increase in employment growth relative to what would occur without the minimum wage increase. This slightly higher job growth would add 13,980 more jobs by 2023, raising employment by 0.1 percent by 2023. Like all forecasts, our results may differ if other economic conditions change. A $15 statewide minimum wage by 2023 would generate a significant increase in earnings for about 5.26 million workers in California while creating a small price increase borne by all consumers. Our estimates for Fresno County project larger wage and cost effects and a close to zero but positive effect on employment. How can such a major improvement in living standards occur without adverse employment effects? The answer is that minimum wage increases generate both negative and positive employment effects. 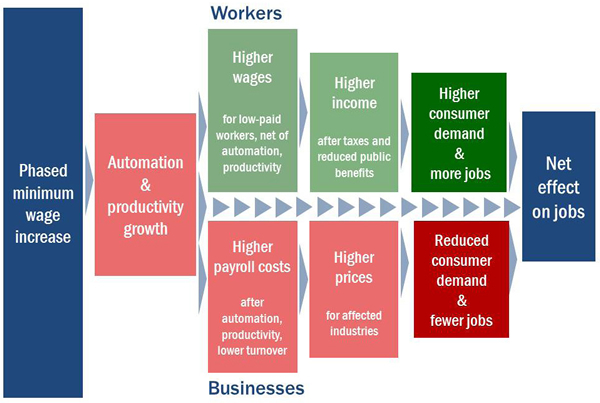 A higher minimum wage induces some automation, as well as increased worker productivity and slightly higher prices; these are the negative effects. A minimum wage increase simultaneously reduces employee turnover, which reduces employers’ costs, and it increases worker purchasing power, which stimulates consumer demand. These are the positive effects. As it turns out, these negative and positive effects on employment largely offset each other, in both California and in Fresno County.